At SWITCH we operate SWITCHengines, a public OpenStack cloud for Swiss universities. To expose our services to the public Internet, we use the popular open source nginx reverse proxy. For the sake of simplicity we show in the following figure a simplified schema of our infrastructure, with only the components relevant to this article. 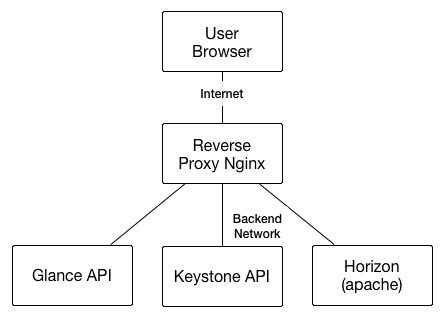 Every endpoint API service and the Horizon Dashboard are available behind a reverse proxy. Our users reported not being able to upload images using the Horizon web interface when images were large files over 10GB. We did some tests ourselves and we noticed that the image upload process was too slow. Looking at log files, we noticed that the upload process for an image of 10GB was slow enough to make the Keystone auth token expire before the end of the process. Why was uploading so slow ? 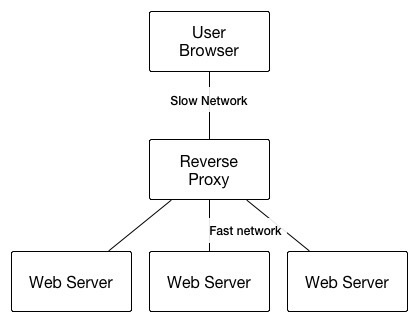 The usual scenario for the reverse proxy is load balancing to a pool of web servers. There is a slow network, like the Internet, between the users and the proxy, and there is a fast network between the proxy and the web servers. The goal is to keep the Web Servers busy the smallest possible amount of time serving the client requests. To achieve this goal, the reverse proxy buffers the requests, and interacts with the web server only when the request is completely cached. Then the web server interacts only with the proxy on the fast network and gets rid of the latency of the slow network. If we look at the default settings of Nginx we note that proxy_buffering is enabled. However the proxy_buffering configuration directive refers to the traffic from the web server to the user, the HTTP response that is the largest traffic when a user wants to download a web page. But what happens if the user’s network is also a very fast network such as SWITCHlan? And does it make sense to have such large buffers for big files over 10GB ? Let’s see what happens when a users tries to upload an image from his computer to Glance using the Horizon web interface. You will be surprised to know that the image is buffered 3 times. The user has to wait for the image to be fully uploaded to the first nginx server in front of the Horizon server, then the Horizon application stores completely the image again. At this point the public API Glance is again published behind a nginx reverse proxy and we have to wait again the time to buffer the image and then finally the last transfer to Glance. This 3 times buffering leads to 4 upload operations from one component to another. A 10GB images then requires 10GB on the Internet and 30GB of machine to machine traffic in the OpenStack LAN. Buffering does not make sense in our scenario and introduces long waiting times for the buffers to get filled up. To improve this situation we upgraded nginx to 1.8 and we configured both proxy_buffering and proxy_request_buffering to off. With this new configuration the uploaded images are buffered only once, at the Horizon server. The process of image upload with web interface is now reasonably fast and we don’t have Keystone auth tokens expiring anymore.